This antibody detects endogenous levels of total galectin 9/Gal-9 protein. Synthetic peptide corresponding to Human galectin 9/Gal-9 aa 51-100 (internal sequence). Previously labelled as galectin 9. Our Abpromise guarantee covers the use of ab69630 in the following tested applications. WB 1/500 - 1/1000. Detects a band of approximately 40 kDa (predicted molecular weight: 40 kDa). Binds galactosides. Has high affinity for the Forssman pentasaccharide. May play a role in thymocyte-epithelial interactions relevant to the biology of the thymus. Inhibits cell proliferation. It is a ligand for HAVCR2/TIM3. Induces T-helper type 1 lymphocyte (Th1) death. Isoform Short acts as an eosinophil chemoattractant. Peripheral blood leukocytes and lymphatic tissues. Overexpressed in Hodgkin disease tissue. Contains two homologous but distinct carbohydrate-binding domains. Cytoplasm. Secreted. May also be secreted by a non-classical secretory pathway. Immunofluorescence analysis of NIH/3T3 cells using ab69630 at 1/500 dilution, with (right panel) or without (left panel) the immunising peptide. Ab69630 recognizes the partial tagged recombinant Human galectin 9/Gal-9 protein (galectin 1 domain only) which has an expected molecular weight of 19 kDa. ab69360 (4µg/ml) staining galectin 9 / Gal-9 in human lymphoma using an automated system (DAKO Autostainer Plus). Using this protocol there is cytoplasmic and secreted staining throughout the tumour. I am confirming that I have logged your phone call in our system. If you have any future inquiry please do not hesitate to call us back again. Thank you for the response. I will try 5% BSA. I have tried anywhere from 1 second to overnight exposure using Pierce Dura substrate. 50-75ug of protein is millions and millions of cells, which is unacceptable for an antibody. Most antibodies we have will detect the protein with less than 100,000 cells. Besides, the data sheet that comes with the antibody has 5ug loaded. If we need to load multiple T150s of cells to get the antibody to work we will definitely be returning the antibody and requesting a refund. Please let me know if you have any success by changing the blocking buffer. It is actually not that uncommon to load such amounts of whole cell lysates, however if that is not feasible for your experiments I am happy to offer a replacement or refund. I look forward to your reply so that I may assist you further. Have a great weekend! I am not getting a signal with your gal9 antibody. I have loaded 100,000 cells to 1,000,000 cells (approximately 5ug of protein like the blot on the website did). These are HeLa cells. I've tried both PVDF and nitrocellulose membranes. I am using PBST 0.05% with 5% milk. I used a 1:500 of the gal9 ab overnight, and a 1:1000 of anti-rabbit HRP for 3 hours. I did my final wash in PBST 0.05%. I loaded several lanes of my cell lysate on the same gel, same transfer/membrane, and then probed with a different antibody and that worked just fine, so transfer was ok. Thank you for contacting Abcam regarding ab69630. I am sorry that you have been experiencing difficulties with this antibody in WB. I have reviewed the protocol information you provided and I would like to make some suggestions to improve your results. My first recommendation is to increase the amount of protein loaded on the gel. We typically suggest 50 - 75ug of total protein. Additionally, I would recommend blocking with 5% BSA rather than milk, as this is what we have tested with the antibody. 5% BSA should also be used as the antibody diluent. A 1:500 dilution is what is recommended on the datasheet, butyou may need to modifiy this with your samples and try a higher concentration of antibody. Also, how long is your exposure time? If these suggestions do not improve your results with this antibody and you are contacting us within 6 months of purchase, I am happy to offer a replacement or credit in accordance with our Abpromise guarantee. Thanks very much for the reply. One more question, where did you get the Galectin 9 standard? 1) Peptide-Based ELISA: Coat immunogen peptide in 96-well plate. 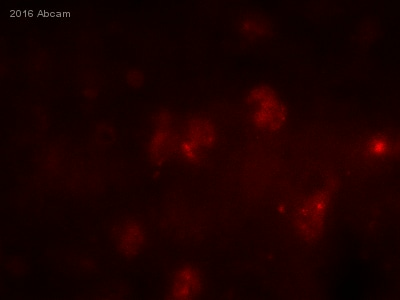 Detect with this antibody. 2) Cell-Based ELISA : Grow cells in 96-well plate. Fix cells. Detect with this antibody. 3) Antibody-Microarray testing : Array antibodies on a slice. Label cell lysate with Cye3. Hybridize Cye3-labelled cell lysate with the slice. Scan the slice after washing. This method detects native protein. i have the number of the product ab69630. I wait for your response. Thank you! Thank you once again for taking the time to contact us. I am sorry to hear you have had difficulty obtaining satisfactory results from this antibody. As requested, I have obtained a copy of the testing protocol. Please bear in mind that this is a guideline only, and may require some further individual optimization in your laboratory. 1. Incubate slide at 60℃ for 60 minutes. 2. Deparaffinize in Xylene for 10 minutes and repeat one more times. 3. Hydrate in 100% alcohol for 5 minutes, in 95% alcohol for 5 minutes, in 85% alcohol for 5 minutes, in 75% alcohol for 5 minutes. 4. Dip into Distill Water for 5 minutes. 5. Dip into TBS (50 mM Tris, 100 mM NaCl, pH 7.6), leave for 5 minutes, and repeat two times. 6. Bring 500 - 2000 ml 10 mM citrate buffer (pH6.0) to the boil in a stainless steel pressure cooker. 7. Put the slide into staining rack and lower into pressure cooker ensuring the slide is well immersed in citrate buffer. 8. When the pressure indicator valve has risen after 3-4 minutes, incubate for 1 minute. 9. Cool the slide naturally to room temperature. 10. Dip into distilled water, leave for 5 minutes, and repeat two times. 11. Dip the slide in TBS for 5 minutes and repeat two times. 12. Immerse slides in 3% H2O2 (in fresh methanol) for 15 minutes at room temperature. 13. Wash with distilled water two times, 5 minutes each time. 14. Wash with TBS (pH 7.6) two times, 5 minutes each time. 15. Dilute primary antibody with 3% BSA in TBS. Cover the tissue section on the slide with diluted primary antibody (use 50 – 150 μl for each slide). 16. Incubate at 37℃ for 30 minutes or at room temperature for 60 minutes (The optimal incubation time, incubation temperature, and antibody dilution should be determined by the individual laboratory). 17. Wash with TBS two times, 5 minutes each time. 18. Incubate with 100-200μl Polymer Enhancer. Incubate 30 minutes at 37℃. 19. Wash with TBS for 3 times, 5 minutes each time. 21. Wash with TBS for 3 times, 5 minutes each time. 22. Add DAB solution and incubate 3-10 minutes (The reaction progress and the optimal time should be determined according to microscope). 23. Wash with distilled water for 2 times, 5 minutes each time. 24. Counterstain sections in hematoxylin if required, wash with distilled water. Immerse slides in 0.1% HCl- ethanol for 1-10 seconds, wash with distilled water. 25. Dehydrate through 95% ethanol for 1 minute, 100% ethanol for 2×3min, Xylene for 2×3min, and cover slip with mounting medium. We don't have a complete kit as such for IHC. But we do sell various preprepared buffers and detection kits. I have copied some links below to pages from our website providing a list of products. With regards to your results, I would like to reassure you that this antibody is tested and covered by our 6 month guarantee for IHC-P and Mouse, Rat and Human samples. In the event that a product is not functioning in the tested applications and species cited on the product data sheet (and the problem has been reported within 6 months of purchase), we will be pleased to provide a credit note, free of charge replacement or refund. We bought this anti-human Galectin 9 antibody, and would like to use it for ELISA. Can you please email me how you did your ELISA testing with this antibody? Sandwich ELISA or Direct Elisa? Regarding our testing conditions for ELISA, this was tested for immunogen-coated ELISA using a conjugated secondary antibody. It has not been tested in sandwich ELISA. 1. Dilute the antigen to a final concentration of 20 ug/ml in PBS or other carbonate buffer. Coat the wells of a PVC microtiter plate with the antigen by pipeting 50 ul of the antigen dilution in the top wells of the plate. Dilute down the plate as required. 2. Cover the plate with an adhesive plastic and incubate for 2 h at room temperature, or 4oC overnight. The coating incubation time may require some optimisation. 3. Remove the coating solution and wash the plate three times by filling the wells with 200 ul PBS. The solutions or washes are removed by flicking the plate over a sink. The remaining drops are removed by patting the plate on a paper towel. 4. Block the remaining protein-binding sites in the coated wells by adding 200 ul blocking buffer, 5% non fat dry milk or 5% serum in /PBS, per well. Alternative blocking reagents include BSA. 5. Cover the plate with an adhesive plastic and incubate for at least 2 h at room temperature or, if more convenient, overnight at 4oC. 6. Wash the plate twice with PBS. 1. Add 100 ul of diluted primary antibody to each well (recommended dilution is 1:5000). 2. Cover the plate with an adhesive plastic and incubate for 2 h at room temperature. This incubation time may require optimisation. Although 2 hours is usually enough to obtain a strong signal, if a weak signal is obtained, stronger staining will often observed when incubated overnight at 4oC. 3. Wash the plate four times with PBS. 4. Add 100 ul of conjugated secondary antibody, diluted at the optimal concentration (according to the manufacturer) in blocking buffer immediately before use. 5. Cover the plate with an adhesive plastic and incubate for 1-2 h at room temperature. 6. Wash the plate four times with PBS. Although many different types of enzymes have been used for detection, horse radish peroxidase (HRP) and alkaline phosphatase (ALP) are the two widely used enzymes employed in ELISA assay. It is important to consider the fact that some biological materials have high levels of endogenous enzyme activity (such as high ALP in alveolar cells, high peroxidase in red blood cells) and this may result in non-specific signal. If necessary, perform an additional blocking treatment with Levamisol (for ALP) or with 0.3% solution of H2O2 in methanol (for peroxidase). 7. Dispense 100 ul (or 50 ul) of the substrate solution per well with a multichannel pipet or a multipipet. 8. After sufficient color development (if it is necessary) add 100 ul of stop solution to the wells. 9. Read the absorbance (optical density) of each well with a plate reader. our lab have ordered the rabbit anti-mouse galectin-9 antibody from Abcam, now, in my project, i need to inject the recombinant mouse galectin-9 protein to interfere with the Tim-3/Galectin-9 pathway , i 'd like to know whether Abcam supply the product about the purified recombinant mouse galectin-9 protein ? thank you! Thank you for your enquiry. I have contacted the originator of the product, but unfortunately, there is only limited amount of the peptide and is not available for purchase. I am sorry I can't be of more assistance in this occasion but if there is anything else that I can help you with, please do not hesitate to contact me.